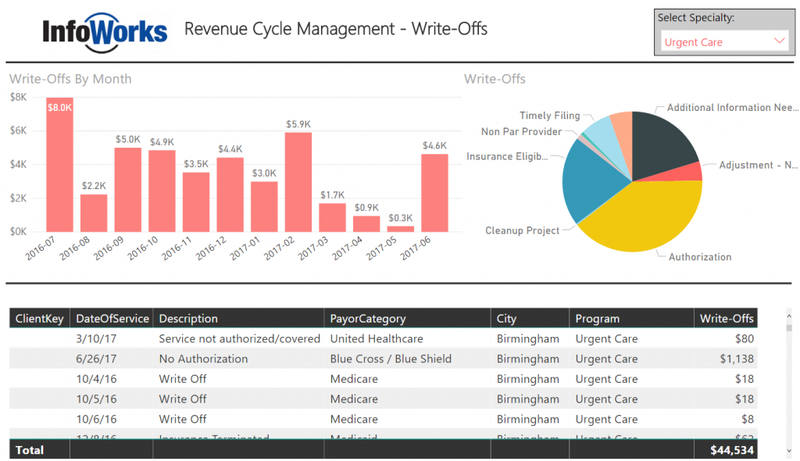 In our first example, we’ll look at Revenue Cycle Management. While not a new concept, strategic use of data will help finance departments minimize accounts receivable, minimize write-offs, and reduce days to collect payment. 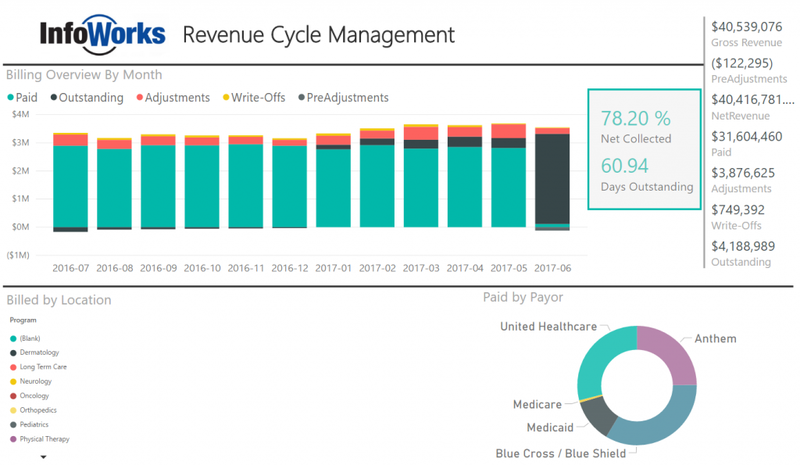 In this dashboard, we show a high-level overview of billed revenue collected over a period of time. Visual cues highlight adjustments and write-offs. The total numbers on the right-hand side change based on what is selected in the graphs. Relatively new reimbursement initiatives incentivize hospitals and even primary care providers to minimize readmissions after initial hospitalizations. 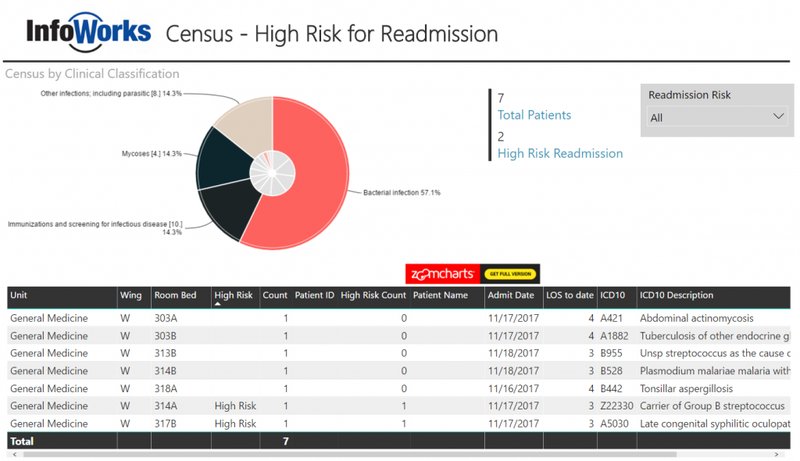 In this dashboard, we use third-party data sources to group diagnoses into clinical classifications for patients currently admitted and identify the patients most likely to be readmitted based on clinical criteria. This is an example of a “prospective” analytics solution that allows providers to pay extra attention to these patients, all of whom have a primary diagnosis related to infectious disease. The extra attention may be to spend more time on discharge education with the patient, emphasize the importance of medication adherence, follow-up with these patients post-discharge, or even reach out to the primary care physician to ensure the patient recovers without complications. This is a classic case of improving care while reducing costs related to avoidable readmissions. In our final example, we’ll look at a relatively new reimbursement incentive. An “episode of care” is the measurement of all operative and post-operative claims related to a healthcare service or procedure. The most widely used example is hip replacement surgery. 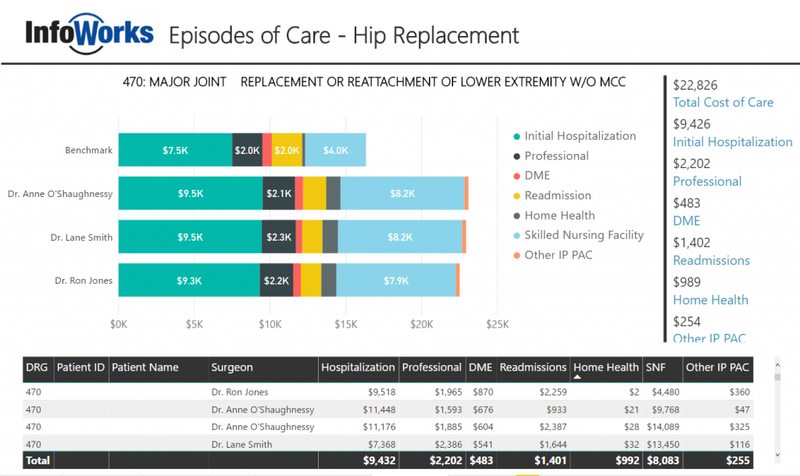 The idea here is that if you are a surgeon and you routinely have an overall lower cost for providing the hip replacement, you will receive an incentive payment from the healthcare insurer/payor. If your total cost of care for the hip replacement is too high, you may receive lower reimbursement. Some payors are now beginning to measure “episodes of care” or “total cost of care” for patients with chronic conditions including diabetes and even schizophrenia. Payors measure the total cost of care over some period of time (i.e.90 days). If primary care providers can keep the total spend down for these patients, they’ll receive additional reimbursement. Here, we will look at three surgeons all of whom have performed multiple hip replacements (Diagnosis Related Group 470). We’ve collected the initial claims plus all post-operative claims including professional fees, durable medical equipment, readmissions, home health, and other post-acute care. Only claims related to the hip-replacement are included. Then, we’ve added a benchmark provided by a commercial insurance company. In this case, the surgeons are not doing well compared to the benchmark. We could also add publicly available high-cost utilization data to further benchmark our surgeons. To compete in a value-driven healthcare system, providers must have access to the right information at the right time to provide a high quality of care at a reasonable cost. Whether you are just starting or have a data warehouse in place, advanced healthcare analytics solutions can help you compete in an ever-changing healthcare system.